Welcome to the July 4, 2007 July 5, 2007 edition of the Carnival of Divided Government Quârtus Decimus - Special Day After Independence Day Edition. So I am a day late. There was just too much pursuit of happiness going on yesterday. The Fourth is such a great holiday. It's a celebration, not a memorial and we are reminded of the brilliant writing, thoughts, and ideas that are the true foundation of our country. Outdoor activities abound (I played golf), along with beer, good food (A slab of ribs from Memphis Minnie's Barbecue), beer, fireworks (we watched from the terrace of a high-rise condo overlooking the bay), beer, and um... more beer. So I didn't get the Carnival done. I didn't last year either. I probably never will get a post out on the Fourth. "Bloomberg revisited the theme, saying partisan gridlock in Washington had paralyzed government and left "our future in jeopardy." He said the nation's "wrong-headed course" could be changed if there is a commitment to shared values and solving problems without regard to party label. "It all begins with independence," he said, opening a University of Southern California conference examining ways to build consensus in a divided government. Progress, he added, "means embracing pragmatism over partisanship, ideas over ideology." As explained in earlier editions, we have adopted Latin ordinal numeration in order to impart a patina of gravitas reflecting the historical importance of the series. In this edition, as in all of the CODGOV series, we select volunteers and draftees from the blogosphere and main stream media on the singular topic of government divided between the major parties (leaving it to the reader to sort out volunteers from draftees). Consistent with this topic, the primary criteria for acceptance in the carnival is to use the words and/or concept of "divided government" in submitted posts. A criteria that, to our endless befuddlement, is ignored by many of the bloggers submitting posts, which sadly results in DWSUWF reluctantly ignoring their fine submissions. Partisan Independence - The key to better governance. "I suspect the president's decision to stand up for fiscal responsibility by threatening to reject appropriation bills he considers too extravagant has something to do with the fact that his party no longer controls Congress. Likewise the legislative branch's sudden enthusiasm for challenging the president's expansive view of executive power. I was pleased by the Republican defeat in last fall's congressional elections, and so far my hope that blind partisanship would serve the cause of limited government seems to have been vindicated... The Democrats are performing an important public service by pressing questions like these, even if they are mainly interested in embarrassing the other party and gaining an electoral advantage. I'd prefer a principled commitment to civil liberties and the rule of law, but I'll take partisan hostility in a pinch." Fact: Divided Government works to restrain the growth of the state. Why it works, while interesting, is not as important as the simple documented historical fact of its efficacy. If voting for divided government is not the best practical libertarian voting heuristic, I don't know what it is or would be. "That seems to be in the public interest. It also happens to be the Democrats’ partisan interest, which is how an adversarial, divided government is supposed to work: there is supposed to be an incentive for power to check power and the vying interests of different branches and different groups to counter one another. This hardly results in the ideal preservation from tyranny that some 18th century gentlemen hoped for, but it is certainly more desirable than having the Congress pathetically prostrating itself before the President and his ministers in all things." "President Bush is threatening to veto spending bills he considers too extravagant—"even if it means the possibility of a government shutdown," according to outgoing OMB Director Rob Portman (as paraphrased by National Journal's Congress Daily). Yes, the president who has surpassed LBJ in discretionary spending, who has vetoed only two bills in six-and-a-half years (rejecting funding for stem cell research and Democrats' conditions on Iraq war money), is belatedly recognizing the virtue of the veto as a means of enforcing fiscal discipline. Between Bush's sudden discovery of his veto pen and Congress' sudden discovery of its oversight powers, this divided government thing is looking pretty good so far. I am not embarrassed yet about last fall's column welcoming the impending Republican defeat." "I was under the impression that democrats held a majority in both houses. Doesn't majority + Republican support = bigger majority? Or is this some kind of new Democratic math? Not that I'm unhappy about it mind you. I favor divided government." "At last Bush seem to be willing to veto excess spending from Congress. This illustrates why divided government is generally good. When his fellow Republicans controlled Congress, Bush never wanted to confront them about excess spending. Now that Democrats are in charge, Bush seems more willing to have a confrontation." Although starting from a different political philosophy, Hell's Handmaiden agrees that "A Broken Harmony" in our Federal government is a good thing, as you can read at Hell's Handmaiden:"
A broken harmony is good news. I say so not with some perverse glee, rejoicing in the break in the Republican phalanx and hoping that this bodes well for the Democrats. No, I say this because the party line is democratic poison." "... while it's certainly true that Pelosi emphasizes in public comments how she differs from the old Republican leadership in her approach and disavows the Hastert doctrine, it's safe to say that the increased polarization and party cohesion that constituted the central story of American congressional politics in the last few decades have continued apace under the Democrats. (Which is a good thing.) Divided government may explain at least some of the discrepancy we might see, since there's still a president of the opposite party around competing to set the agenda and put issues before Congress that might divide the congressional majority." "Essentially, the founding fathers created a constant court battle with the Senate and House of Representatives, a battle-royal for lawyers who want to express their political knowledge... The current administration used political tactics (fear, mostly) to obtain mob rule. Since the Senate and House were both Republican Majority they played ball with the President, effectively giving the administration the ability to CREATE LAWS (such as the Patriot Act)." An interesting perspective, but as we are seeing now - a divided government can undo the damage created by single party control. 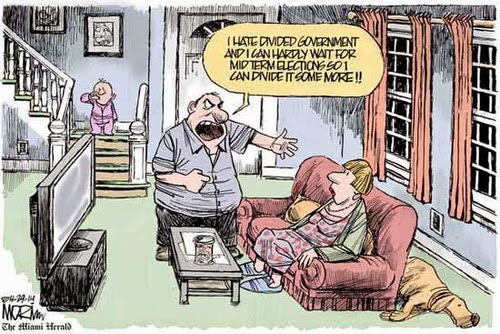 Not everyone agrees that divided government is a proven positive. There is that great majority of partisan dead weight among the electorate, and there are some who want to see more evidence before reaching any divided government conclusions. "One of the most frightening elements of the powers asserted by the Bush administration in the war on terror is the power it claims to arrest American citizens and hold them without access to a lawyer or a judge. The conservatives of the American Freedom Agenda have joined the ACLU in calling for repeal of the Military Commissions Act and restoration of the right of habeas corpus. Cato adjunct scholar Richard Epstein petitioned Congress not to curtail habeas corpus as it considered the Military Commissions Act last fall, to no avail. This issue will provide a good test of the proposition that divided government is a good thing. Will the Democratic Congress do the right thing and restore our constitutional rights?" I am betting on it and laying odds. "If the ghostly Founding Fathers were to rematerialize today, I have it on good authority -- mine -- that they would likely lament not having stamped a 200-year expiration date on their famed document, as a thoughtful safeguard against the vicissitudes of enough time allowing a reasonably good thing to go so terribly bad. In lieu of this, they might very well have rethought their entire experiment in quasi democratic and divided government, sparing only the appended Bill of Rights."... I also imagine the Founding Fathers would have rethought the whole notion of separated government. This leader thinks and does one thing, that leader thinks and does something else, and yet other leaders think and do something entirely different. It's more than a formula for lame-duckdom and mere gridlock till the next election; it's a formula for sustained, recidivist and even absurd stagnation. The people want or demand one thing or another, while the "system" sits and chokes, doing absolutely nothing." He says that like its a bad thing. Of course, being a progressive, Dr. Carpenter believes that the only solution to what ails us is more, bigger, better and more efficient government, presumably led by a Great Progressive Leader marching us ever forward into the brave new world of the new millennium, so I actually see his criticism as further validation of divided government working really really well in a practical way. Really. On the other hand, I am also not particularly interested in waiting for the emergence of a Randian New Libertarian Man as a practical solution to the advancing state. Operative word is "practical". A word that William Dvorak might do well to consider as he proposes to undo "The Political Norm of Centuries" with some wishful thinking posted at The First Creation. And speaking of wishful thinking, there are a number of bloggers who think that the "red/blue madness" can be solved by, or, at least presents an opportunity for third parties. Along these lines, we find Justin presenting "Republicans vs. Democrats: Our Political Downfall" posted at Politics & Religion with "A look at how our divided government is shooting itself in the foot with our two party system." Along those same lines, we have Michael presenting "Congress Approval All Time Low and Third Parties" posted at The Common Virtue. I am sympathetic to their arguments, but remain convinced that the 3rd party route will continue to be a frustrating political dead end. I've outlined my issues with 3rd party efforts before - here and here. When you peel off the rabid partisans on the right and left, then peel off the mildly partisan on the right and left, then peel of the partisan-leaning who still vote from their partisan comfort zone no matter what they say about being independent, what you are left with is less than 10% of the electorate. That is why these fantasies of a ‘moderate’ 3rd party securing a plurality of votes will never happen. They can have exactly one effect in our system. Spoiler. Instead, as a third party alternative, I'd like to invite all interested readers to become founding members of the Dividist Party (although you may want to wait for the Manifesto - stay tuned). We'll have no leaders, no platform, no convention, no contributions, and no candidates. 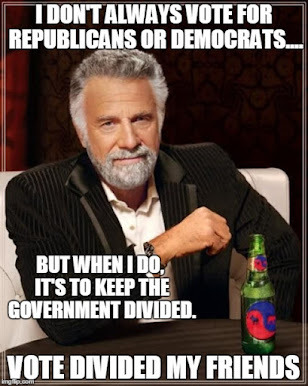 But with an evenly split partisan supermajority, all we Dividists need is about 5-8% of the electorate to vote consciously and consistently for divided federal government to control the political dialog and maintain better and more moderate governance. That’s how Bush got his place in the sun. With that we conclude this edition. Thanks for stopping by, and thanks for all of the submissions (on-topic or not). The next edition will be the Carnival of Divided Government Quîntus Decimus - Special Dog Days of Summer Edition, to be posted August 1st, 2007. Blog articles may be submitted for the carnival of divided government using the carnival submission form. Past posts can be found on our blog carnival index page. Technorati tags: divided government, Michael Bloomberg, Independence Day, 2008 election,3rd party ,blog carnival.